University of Virginia President James E. Ryan. 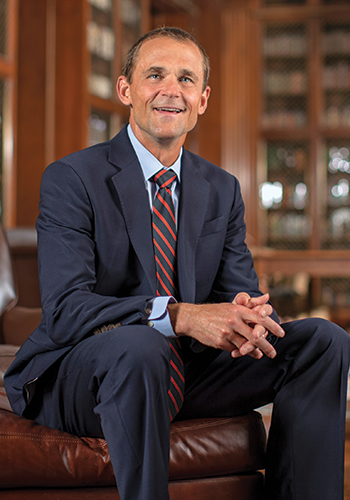 At the start of his tenure in August, Ryan established an “Ours to Shape” website soliciting ideas for crafting a strategic vision for the university’s third century. The university is expanding its footprint in Northern Virginia, with a $55 million investment in genomics research and a partnership with Inova Health System that will include a medical school campus at Inova Fairfax Hospital. A new statewide biocomplexity initiative also is being established, financed by a $30 million startup package and headed by the top researcher who oversaw a similar Virginia Tech program. “U.Va. is reinventing itself for a changing world,” Ryan says of the university, which was chartered in 1819. By email through a U.Va. spokesman, Ryan says the university’s “responsibility to serve the commonwealth and beyond” requires an expanded presence outside Charlottesville. And U.Va.’s biocomplexity initiative, with an Inova satellite site, will be able “to partner with the thriving commercial technology sector” in Fairfax and Loudoun counties. In his speech, he acknowledged “the sins of our past” and noted that African-Americans weren’t admitted until the 1950s and women until the 1970s. Ryan, who succeeded U.Va.’s first female president, Teresa A. Sullivan, has named two women as his top vice presidents: Stanford Law School Dean Mary Elizabeth Magill will become the chief academic officer this summer, and Jennifer “J.J.” Wagner Davis took over as chief operating officer in November after serving as George Mason University’s senior vice president for administration and finance. In an effort to open the university to more low- and middle-income students, Ryan announced that U.Va. no longer would charge tuition to Virginia students whose families earn less than $80,000 annually and have “typical assets.” Those earning less than $30,000 also will receive free room and board. 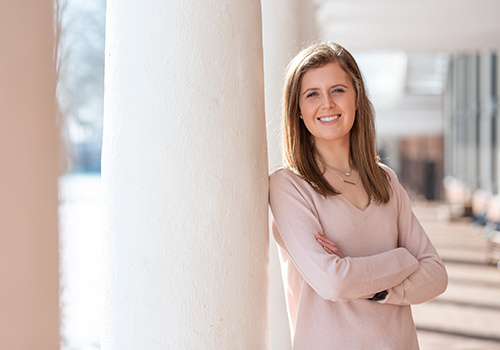 For Lauren Higgins, a third-year student from Midlothian, the decision represents an “incredibly encouraging” step toward making U.Va. more diverse. Higgins was among several hundred people who participated in one of Ryan’s “Ours to Shape” community conversations in late November during which some participants raised the issue of how the university can be elite but not elitist. “Elite is kind of a fraught word, isn’t it?” Ryan responded. And now an online search for U.Va. brings up images of the white supremacist rally of August 2017, she added. Higgins later told Virginia Business in an email that the university “has endured its fair share of trials” that have been a test of its character and resilience. But she is optimistic the school will emerge “in this pivotal moment” as a leader unafraid to address hard questions. Higgins says the question about U.Va.’s culture arises so frequently during tours that she has prepared a response based on her own experiences. “I feel that this community, while not perfectly diverse, makes a consistent effort to embrace and share the differences we have,” she says. The new tuition promise will apply to about 1,900 in-state undergraduates next year, says university spokesman Anthony de Bruyn. Current financial aid packages essentially meet this need, but “we believe it’s important to make an explicit promise” as a commitment to low- and middle-income families. He says this is the first step in a larger and longer project to look at financial aid packages for in-state and out-of-state students. In May, U.Va. appointed Gregory Fairchild, a Darden School of Business professor, as the university’s first director of operations for Northern Virginia. Ryan says Fairchild will lead a task force set up to examine “what makes sense” for the university through its partnership with Inova, which owns the former ExxonMobil campus in Fairfax County. U.Va. and George Mason University have joined with the Inova Center for Personalized Health to establish the Global Genomics and Bioinformatics Research Institute (GGBRI) there. In September, the board of visitors approved $55 million in funding to be paid in three installments to retrofit the Inova building for the institute. Construction is expected to be completed by the fourth quarter of 2020, says Eric Swensen, public information officer for the U.Va. Health System. At the same meeting, the board approved a resolution committing to a broader academic presence at the Inova Health System facility in Fairfax beyond the previously approved medical campus. The board tapped earnings from the university’s Strategic Investment Fund for the genomics research institute capital project and for a hiring package for the new Biocomplexity Institute and Initiative. While GGBRI has not yet begun recruiting researchers, the Biocomplexity Initiative has about 68 researchers and support staff and is expected to grow substantially during the next three to five years, according to Swensen. The initiative’s headquarters is in Charlottes­ville, but researchers also are based in Northern Virginia. Although it will collaborate with GGBRI, the two institutes “are working to solve different kinds of questions,” Swensen says. The goal of GGBRI is to translate genomics research into personalized medical treatments, drugs and devices. The Biocomplexity Initiative brings together scientists from many fields to use high-performance computing capabilities to address problems spanning human health and behavior, the ecology of living systems, public policy, technology and infrastructure. Christopher L. Barrett, a professor of computer science who held a similar position at Virginia Tech, was hired as the program’s executive director. The new School of Medicine campus at Inova Fairfax is scheduled to begin operations in February 2021. Swensen says the campus will allow up to 72 medical students to complete their third and fourth years at Inova. Meanwhile in Charlottesville, a $394 million renovation and expansion of the university hospital is underway. The project will add 440,000 square feet and renovate another 95,000 square feet. The work will expand the Emergency Department from 43 to about 80 beds and include dedicated space for mental health services. 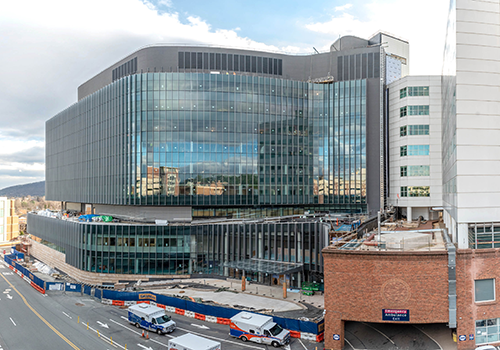 The project increases space for interventional services for patients needing surgeries or other procedures, including four new operating rooms. That portion of the work is scheduled to be completed by fall. The project also includes construction of a six-story tower atop the expanded emergency and procedural space. Three of the floors will accommodate the conversion of most of the medical center’s semiprivate rooms to private. The first new floor is expected to open in 2020, with the top three floors built as shell space for future expansion, Swensen says. Renovations to the existing space will be completed in 2021. When Amazon announced it would put half of its second headquarters in Arlington, Ryan celebrated the news with a statement detailing U.Va.’s involvement in Northern Virginia, including the Darden School of Business’ new facilities in Rosslyn and a joint degree in business analytics offered by Darden and the McIntire School of Commerce. Virginia Tech announced its plans for a $1 billion innovation campus near the Amazon HQ2. Ryan says every college and university in the state will benefit from the increase in opportunities Amazon will bring. “In this case, a rising tide really will lift all boats,” he says.